A “Jeopardy!” contestant took full advantage of his appearance on national TV on Thursday, proposing to his girlfriend mid-show. 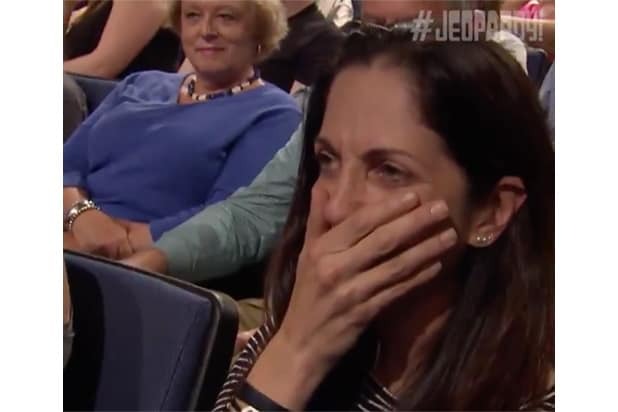 Michael Pascuzzi, a store manager from Florida, chose to forgo the traditional introductory interview with host Alex Trebek, instead pointing to his girlfriend, Maria Shafer, who was watching from the audience. A tearful Shafer quickly replied “Yes of course!,” apparently ruining a joke Trebek was planning to make. “Maria, you responded too quickly. I was about to say we’ll have the answer to that question right after this commercial break,” the host quipped. Shafer soon realized her other mistake, the classic “Jeopardy!” blunder of forgetting to phrase her answer in the form of a question. “That would be, what is yes?,” she corrected.